One of the points of this blog is to share recipes that I try and enjoy, and since I’ve been blogging so much about Hong Kong and Asia lately, a quick-and-easy Chinese stir-fry recipe seemed very appropriate. This recipe can easily be made gluten-free and vegetarian if you choose, and it’s easy to whip up on a weeknight after work – it takes less than 30 minutes in all. Enjoy this little taste of Asia! Meanwhile, add 1 tablespoon oil to a large wok (or skillet) over medium-high heat. Add chicken to hot oil, and saute 4 minutes or until browned and cooked through. Add water chestnuts, onion, and bell peppers to chicken; cook 2 more minutes. Add in soy sauce, brown sugar, garlic powder, salt, red pepper and paprika to the contents of the wok; stir in well. Cook 2 minutes or until everything’s thoroughly heated and sauce is slightly thickened. Divide noodles into 3 – 4 equal portions. Serve chicken and veggies on top of noodles. A small portion of the finished product in the wok. 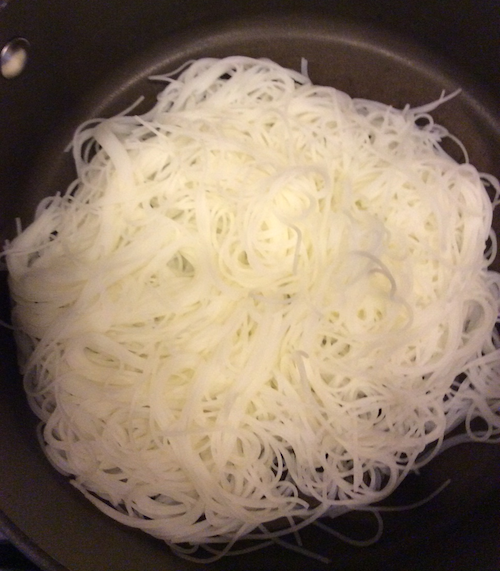 The rice stick noodles that go under the stir fry. 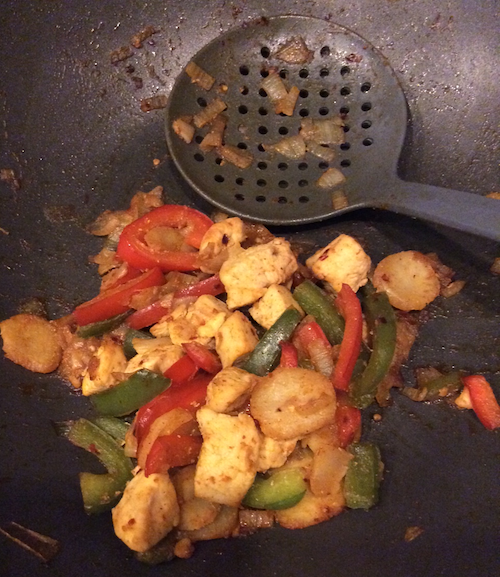 This entry was posted in Entrees, Recipes and tagged Chicken, Chinese, Entrees, Gluten Free, Noodles, Recipes, Stir fry on April 16, 2014 by Paige N..